No matter how I try I can’t get Skater to like roast potatoes. It probably is a blessing in disguise because I can’t resist them. Just the thought of roast potatoes is enough to prompt me to turn on the oven. Instead, a piece of pumpkin fell out of the fridge onto my foot and it’s fate was sealed. So, ever hopeful, while I was chopping it up to be roasted into the most delicious salad, I enquired if Skater may be tempted by Roast baby Lamb Leg with a side of Roasted Pumpkin. To my enormous surprise he said yes. O.M.G I knew if I just kept cooking, one day it would get eaten! You can eat this warm as a side dish or at room temperature depending on just where you are in the world. 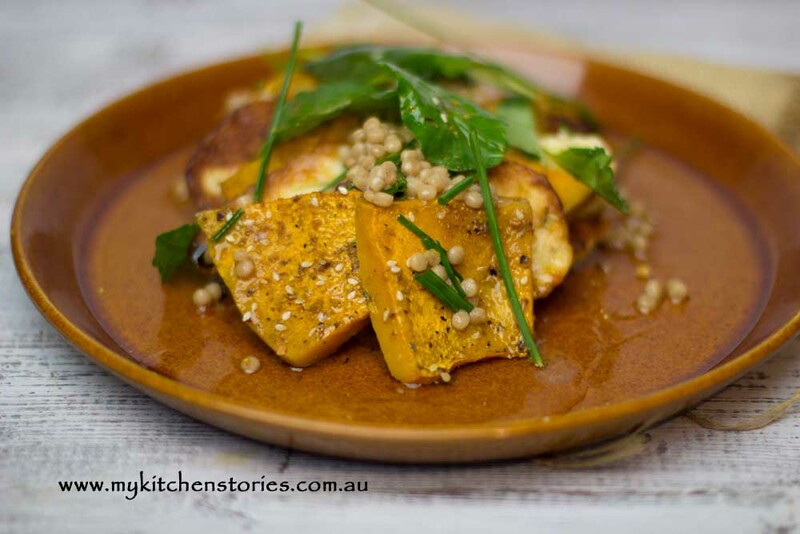 Salty crispy haloumi seems like it could almost be the most perfect match to pumpkin ever, and just so happened to be lurking in the crisper too. I’ve used a giant wholemeal (wholewheat) couscous or Moghrabieh. I love the shape and texture and it soaks up dressing making them little bombs of flavour. You could use any other grain you want including Quinoa. The beauty of this is the sweet sweet pumpkin and the salty squeaky cheese. This is so simple and it goes with so many things. Chicken, Steak, Lamb and add a little more lemon or some chopped preserved lemon and pair it with fish. I made enough to last for a day or so, cause it keeps so well. The next day, just to prove I have no real green prejudice I added green beans because Skater also said he would eat these. I wonder if you can hear me whooping from your place. Sometime soon I will be able to cook all the things I want to eat. Put a small pot of water on the stove to boil and add a little salt when boiling, add the giant couscous and simmer until tender. Drain and set aside. Meanwhile heat the frypan making sure it is quite hot before adding a little oil and then the Haloumi in batches. Turn when golden on one side and then turn and brown the other side. Put onto a plate or onto the side of the pumpkin tray. Make the dressing by mixing all of the dressing ingredients and shaking or mixing well. Taste. Adjust if necessary. Toss the couscous and the chives in the dressing. 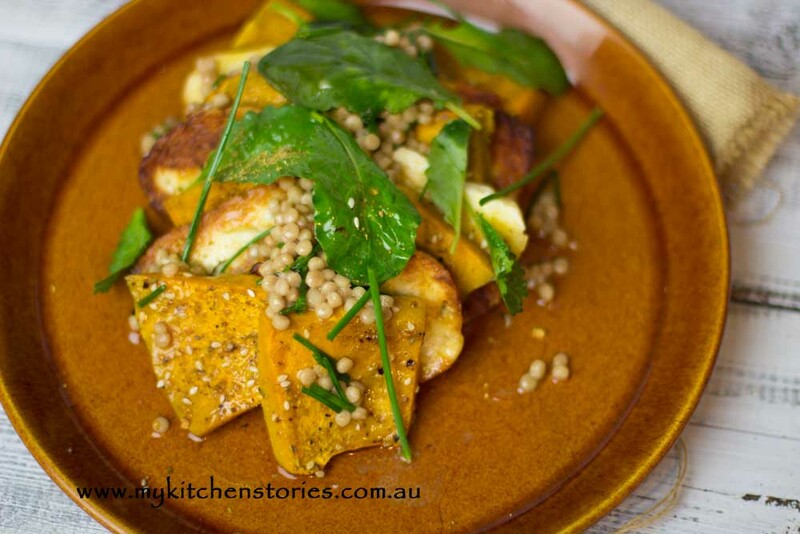 Layer the Pumpkin and Haloumi on a plate and pour over the couscous mixed with dressing and finish with baby Kale leaves. I noticed someone blogged a massaged kale salad the other day. I had to do a double take and thought, wtf? Seriously? This is what food is becoming? We’re massaging herbs and vegetables now? I really want to take a wet leaf of kale and smack them across the head. This salad, however, is simple and tasty. No massaging required, even if you were to use large leaves. Now, I must run as I need to massage my trout before I put it under the grill. I’ve danced around how much I dislike kale. I don’t like the bitter taste – it’s just not for me. Hehe I’m totally into roast potatoes too, especially if it is really crispy edged! 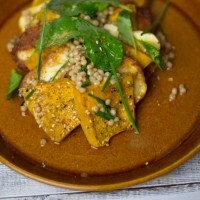 I roast pumpkin with feta a lot-will try halloumi sometime! I adore kale…and one way to get my husband to eat kale is to mix with avocado and use it as the dressing for his salad..you know what? He finished EVERY SINGLE salad leave I put on his dinner plate…and I didn’t just put little, but the whole plate FULL…sorry for the long blabbering. Your salad looks terrific, Tania, I love it. You had me at roasted potatoes, but wait I like potatoes prepared any and every way. This looks tasty. Haven’t cooked with kale lately, may have to rethink that. 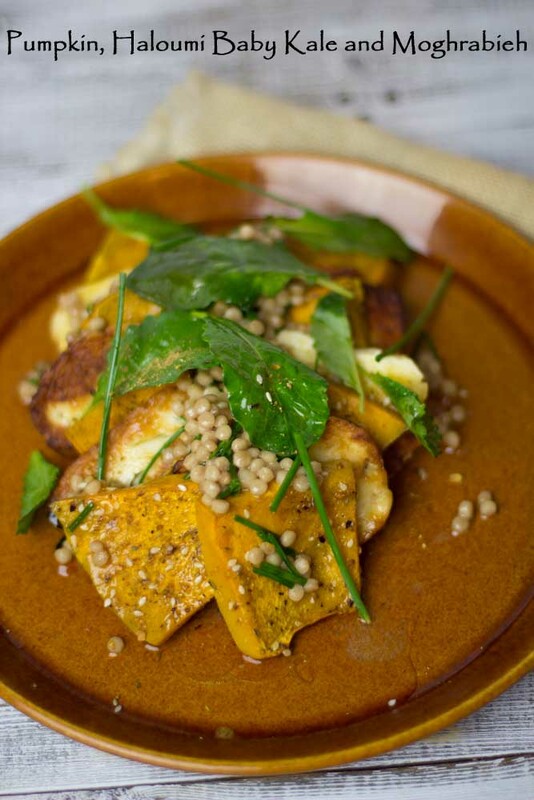 I have always associated halloumi with summer grilling, but how exceptional to see it move over into the fall season with pumpkin and earthy flavours. Love it. Skater is full of surprises! I’m used to children / teenagers who will eat roast potatoes but turn their noses up at pumpkin. This certainly looks delicious though so I can understand him liking it. I think that kale is such a waste of time – so massaged kale just blows my mind. This salad on the other hand sounds delicious!